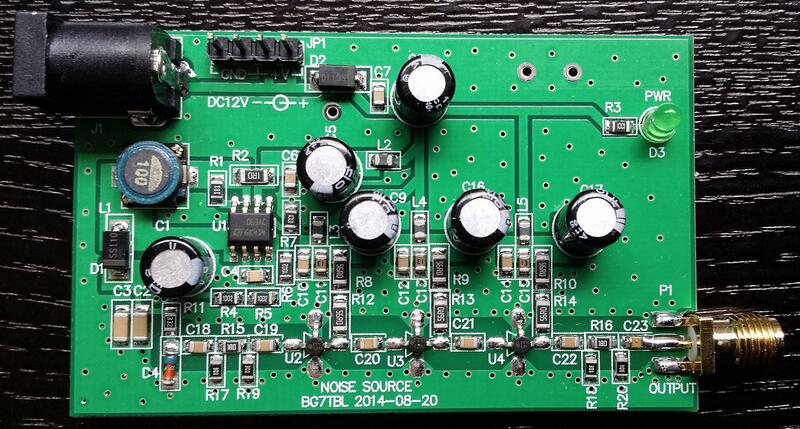 If you have a ham-it-up upconverter and are good at soldering small surface mount components you might instead consider purchasing the noise source kit add on. Here is a video showing how to build and test the ham-it-up noise source. We will use rtl_power with the RTL-SDR Panorama GUI to record and graph a frequency sweep over the effective range of the filter. If you are experienced with command line use of rtl_power you may also use it without the GUI. To set up RTL-SDR Panorama place the rtlpan.exe file into the same folder as rtl_power, which can be obtained from the official RTL-SDR release, or from one of keenerds builds (GitHub for Linux). We recommend using keenerds builds as his modified drivers seem to retune much faster making scans of large bandwidths significantly faster. 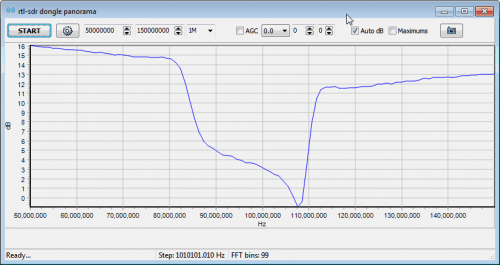 To characterize a filter simply connect the noise source to the input of the filter and the RTL-SDR to the output. Then open RTL-SDR Panorama and set the frequency range to the expected range of the filter and set the resolution to 1M. Also set the gain to 0 and enable Auto dB. Next click start and after a few seconds a graph of your filter response should be generated. 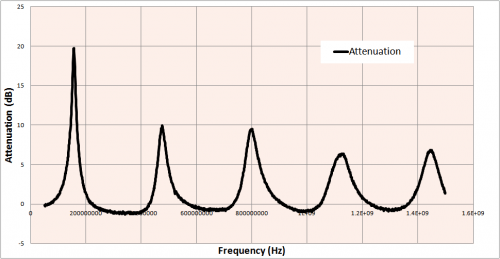 The image below shows the response of a cheap FM bandstop filter, such as the one available from MCM electronics plotted between 50 MHz and 150 MHz. After viewing the response in RTL-SDR Panorama we recommend plotting the same graph against a baseline graph of just the noise source connected directly to the RTL-SDR. This can be done using Excel or any other similar plotting software. Each time RTL-SDR Panorama finishes a frequency sweep, the data is stored in a CSV file called scan.csv. It will be located in the same folder as rtlpan.exe. First do a baseline sweep with no filters connected and then stop RTL-SDR Panorama by pressing the stop button. Note that after you press the stop button the final sweep will still be running, so wait until it finishes first. Next rename scan.csv to baseline.csv. Now do a sweep with the filter connected - this will create a new scan.csv file. Next open baseline.csv in Excel. You should notice that the third column C contains the frequency values and the last column G contains the power data. Use the excel plotting tools to create a scatter plot in baseline.csv with frequency on the x-axis and power on the y-axis. Finally, open the scan.csv which contains data for the scan with the filter. Copy the last column containing the power values (column G), and paste it into baseline.csv next to the baseline power values. Add a plot of the filtered power values to the same plot as the baseline plot and compare. Next you can calculate the attenuation by simply subtracting the baseline column from the filter power column. 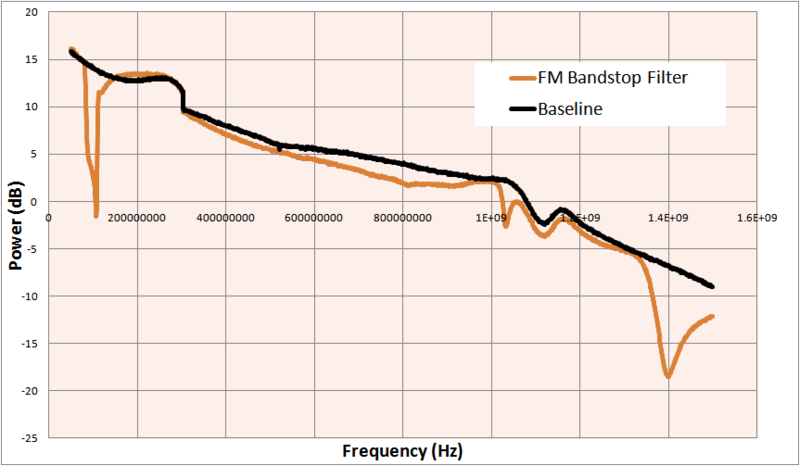 The plotted graph below shows the difference between the baseline plot (no filter connected) and the FM bandstop filter plot. There is a clear dip in power in the FM band at 88 - 108 MHz. 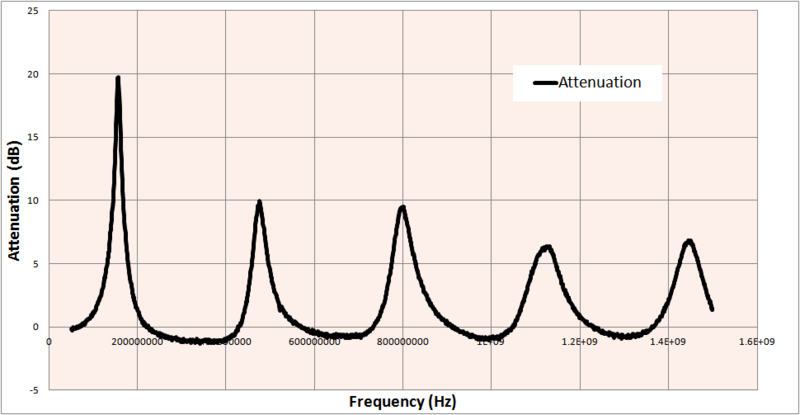 There is also another dip at around 1.4 GHz, and some slight loss over the rest of the band due to the filter or possibly due to the type of connectors used. This next plot shows the attenuation, which is simply the baseline plot subtracted from the FM bandstop filter plot. The attenuation shows how strongly a signal at a particular frequency will be reduced in strength. 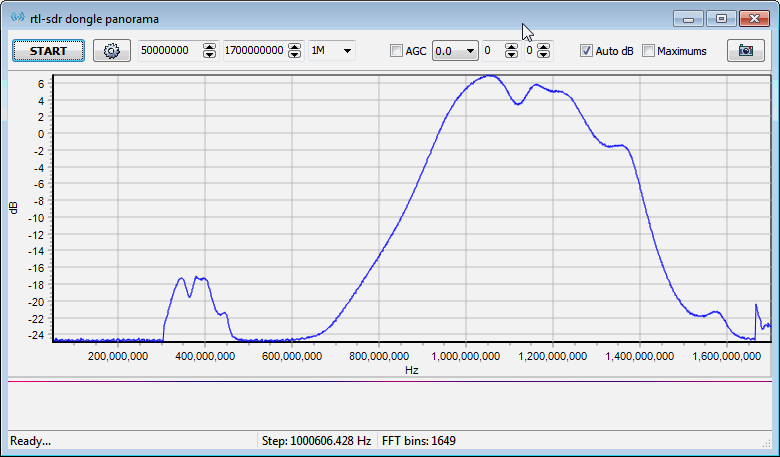 In the graph we can see that the FM band has an attenuation of around 10 - 15 dB. 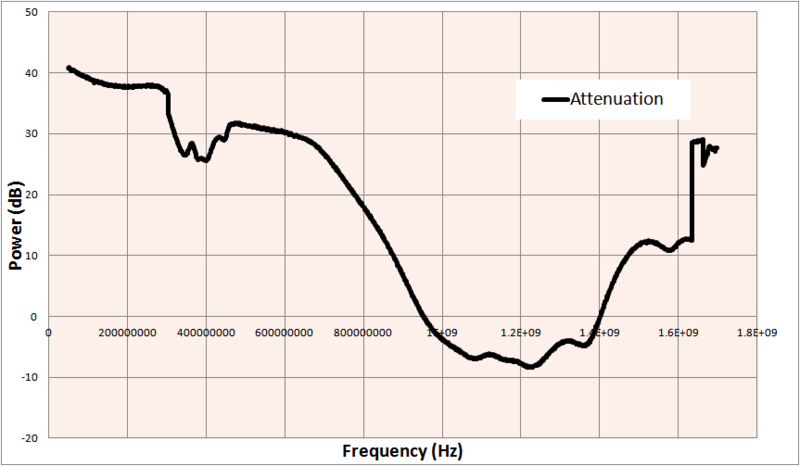 Below we also show the attenuation of the 1090 MHz ADS-B bandpass filter. Another class of filters that can be tested with a noise source and RTL-SDR are coax notch filters, aka coax stub filters. Coax stub filters are simply a length of coax, cut to 1/4 wavelength * velocity factor of the desired notch frequency. The required length can be calculated using a calculator, or by using the equation: When cutting the coax we recommend cutting the coax a little longer and then using the noise source and RTL-SDR to fine tune the length. The velocity factor is a parameter that is unique to each brand and type of coax cable. If you are unsure what the velocity factor is, we recommend either using the calculator (it has pre-set velocity factor values for various coax types) or determining it through the instructions shown in next heading. To test these filters you will need a T-junction (3-way) coax splitter. In this experiment we used a 3-way splitter with SMA connectors and used RG174U cabling with unknown velocity factor to create the coax stub filter. 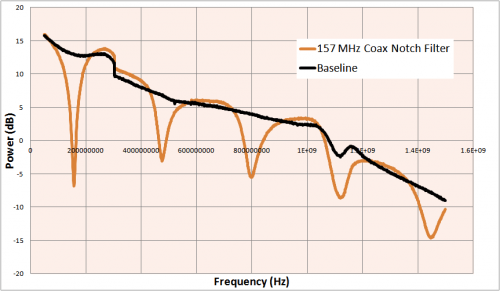 The excel plot below shows the response of a coax notch filter tuned for a notch at 157 MHz, in order to attenuate strong pager signals. 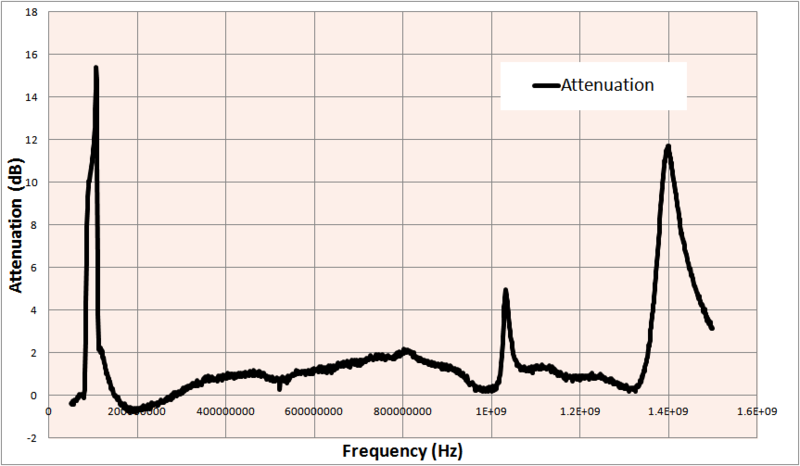 The plot shows that at 157 MHz there is a deep notch as expected. Note that there are also notches present at higher frequencies as well and that the notches can have quite wide bandwidths. This is expected and a potential flaw of coax stub filters. Working backwards from the coax stub formula is it possible to determine the velocity factor of an unknown piece of coax. Simply create a coax stub filter of any known length with your suspect coax, then use the above method to measure where the main notch lies. Then use the equation: In the previous experiment our coax stub measured 30.8 cm and had a main notch at 157 MHz. So we have a velocity factor given by the following calculation. VF = 157 * 0.308 / 75= 0.645 This is quite close to the expected velocity factor value for most brands of RG174U which is 0.66. 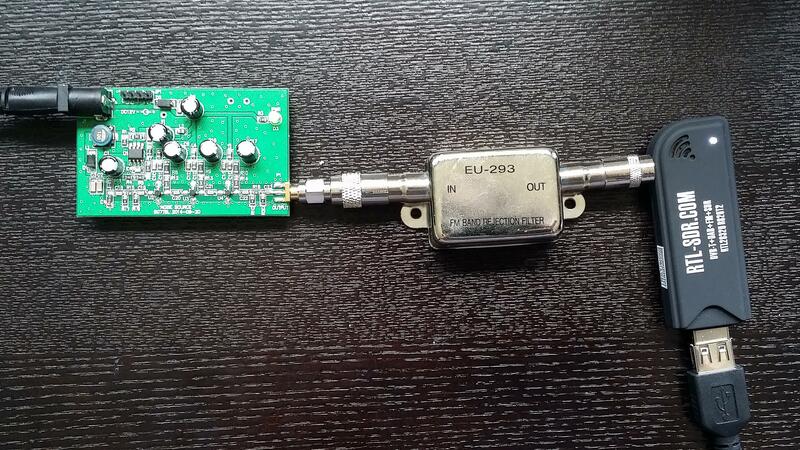 An RF Bridge from transverters-store ($15 USD) or eBay ($12 USD) + a 50 Ohm dummy load to put on the REF SMA plug. MiniCircuits directional couplers can often be found used, but in good condition on eBay for about half price. You could also consider using an extremely cheap $2 TV antenna 'tap', see this post for more information. In our experiments we actually used a MiniCircuits ZFDC-15-5 coupler with SMA connectors, but they have currently all sold out on eBay. The ZFDC-20-5 should work just as well however. Try and find a directional coupler that works over the frequencies that you are interested in. A good video showing use of a directional coupler in a similar experiment and explaining a bit about how one works can be found here. To measure the VSWR of an antenna we will use the directional coupler in reverse. Here we connect the noise source to the output of the coupler, the antenna to the input of the coupler and the RTL-SDR dongle to the coupling (CPL) port of the coupler. 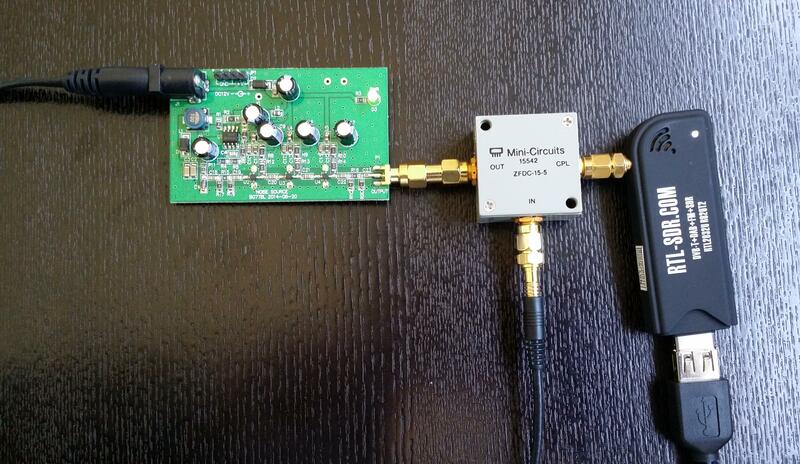 This way power from the noise source should be reflected from the antenna into the RTL-SDR. 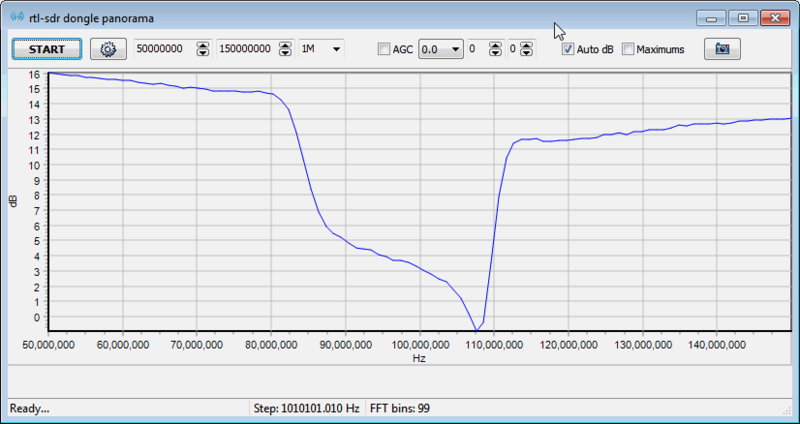 Open the RTL-SDR Panorama GUI and enter the frequency range of which you'd like to check the VSWR of the antenna. Also, set the resolution to 1M and gain to 0. First do a sweep with the antenna disconnected from the coupler. After the sweep is done, stop RTL-SDR Panorama and rename the scan.csv file found in the same folder as rtlpan.exe to swr.csv. Note that after clicking on stop in RTL-SDR Panorama you will need to wait for the current sweep to stop before you can rename the csv file. Secondly do the same sweep but with the antenna connected. Now open the swr.csv file and the latest scan.csv files in Excel or any similar program and copy the power data (the last column) from scan.csv into an empty column in swr.csv. Now subtract the values in the first power column (power with antenna disconnected) from the values in the second power column (power with antenna connected) that you have just copied over. This will give you the return loss. If you get any negative values in the return loss column you may need to adjust the values so that the negative values are forced to be a small positive value like 0.0001. In Excel this can be done using the max function such as "=max(0.0001, J2)". The VSWR can then be calculated from the return loss (RL) with the following equation. Calculate the VSWR in another column. The image below shows what your completed Excel sheet might look like. 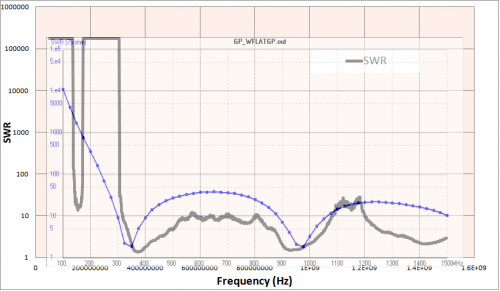 Now plot the SWR using a scatter plot with frequency on the x-axis (horizontal) and SWR on the y-axis (vertical). Change the vertical axis to a logarithmic scale for a better view. Below we show the SWR plot of a monopole antenna that is 23 cm long placed on a 20 cm diameter cookie tin that is acting as a ground plane. A perfect ground plane antenna with a 23 cm long whip should be resonant at about 310 MHz. However, because the ground plane for this antenna is only 20 cm, the SWR minimum point is pushed up to around 355 MHz. At the minimum point the SWR is about 1.15. Using a larger cookie tin would cause the minimum SWR point to approach 310 MHz. 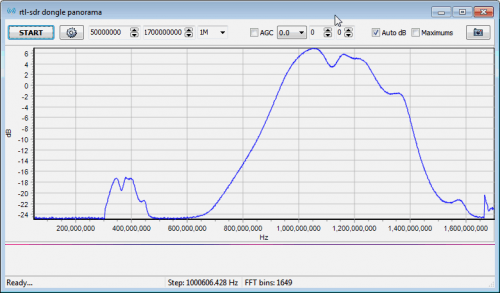 Here we compare our results with a SWR simulation of our 23 cm monopole antenna and 20 cm ground plane made in 4NEC2. We can see that the real world SWR plot approximately matches the simulation. Unmodelled factors such as coax cable and connectors used can explain some of the discrepancies. 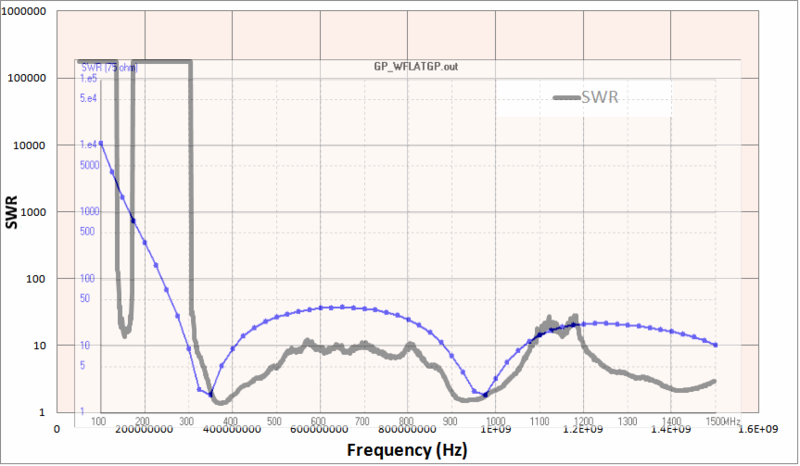 Below we show the SWR plot of a tuned 1090 MHz antenna made for ADS-B reception. The SWR at 1090 MHz is about 1.5. 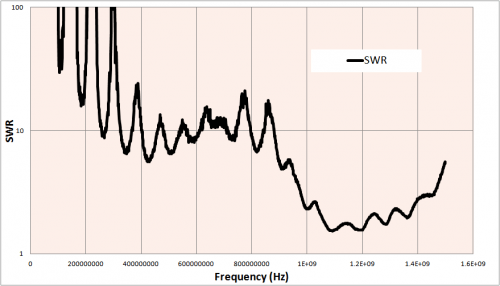 Many people incorrectly believe that the SWR value does not matter for receive only antennas. This misconception probably comes from the fact that a poor SWR value on a transmitting antenna could destroy the transmitter, but a poor SWR value on a receiving antenna poses no such threat. 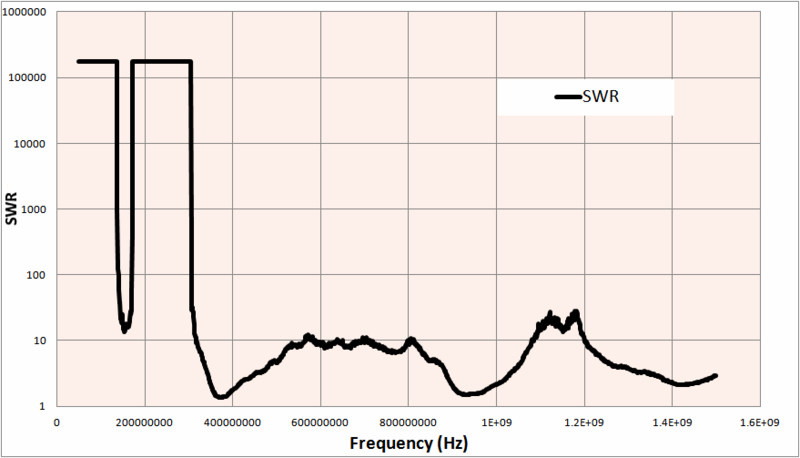 However, while it won't destroy your radio, a poor SWR value will still significantly impact reception. 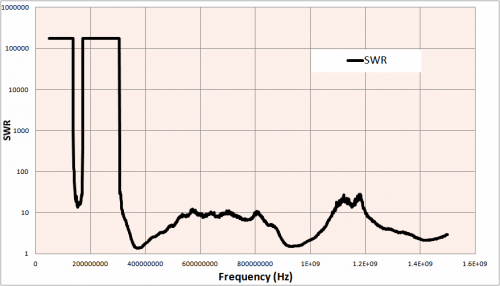 By using the calculator available at http://www.csgnetwork.com/vswrlosscalc.html, it is possible to determine the amount of signal loss you can expect with a particular SWR value. At a SWR of 1.5 we can expect a very small loss of about 0.177 dB (4% of the received power), whilst an SWR value of 10 gives a 4.807 dB loss (67% of the received power). If you enjoyed this tutorial you may like our book available on Amazon. Available in eBook and physical formats. 1. Using the directional coupler method, will I be transmitting RF into the “real world” on all frequencies that my attached experimental antenna can transmit? 2. Can I reduce the dB of the signal without attenuators by using lower voltage on the noise source? Yes, both good observations. The antenna will be radiating where it isn’t reflecting. A) I measure .2A @ 12V after 15 minutes warm up. Output seems flat over first 500MHz and then begins to drop. P=I*E=~2.5W = 4dBW, a large amount of RF power… for a NFM channel. Ours is 10log(500MHz) down, 4dBW-10log(500e6)+30dB=53dBm. -73dBm is MILSpec Off, Part 15 is around 10dB higher. So we should be careful. 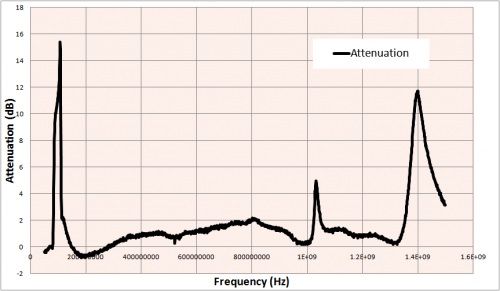 Add 30dB attn and there’s no issue if the gain of the antenna is less than a few dB across the bandwidth. I have found there’s still plenty of headroom with 30dB or more ATTN on these. If you’re measuring a yagi or something you might want to increase that or find something safe to enclose in- aside the surroundings generally detune the antenna during test. B) Someone below in the comments reports better performance driving at a lower voltage. It would make sense that the power would be in lockstep with the voltage to a point. I don’t know, never had any issues driving at 12V, but I have one of those little fans on the board to fight the heat. Run the noise source at 5v. 12v is too high and a design flaw. The breakdown voltage of the zener is way too high and the final transistors are overdriven. @5V the device operates just as well without the heat, better for the front end of your receiver as well, no difference in the result. Use a 50 Ohm RF resistor – or high quality carbon – when terminating the REF port. This is a crucial part of the bridge or the results will always be meaningless. Pay attention to your calibration procedure. The output power of the noise source, across the segment of the spectrum you are interested in, is what you need to concentrate on. The noise source power output will gradually drop across DC-2GHz but will be almost flat across any particular individual band. I use Airspy & Spyverter with the Airspy spectrum analyser software. Chinese noise source and transverters-store RF bridge. How to connect the ebay swr bridge for useing this ? it has 4 ports in stead of 3. any info on that ? Just google before posting next time, ok? There is nothing there on that link. And of course i did google but could not find what i was looking for. So your below also does not make any sense to me. As i have no experience with this before, I need to know to which port to connect my source, my sdr and my antenna. And which port to terminate. In the picture form the blog there is the noise connected to out? That would be totally unlogically to me beacause in have no experience with this..
that is why i am asking questions, it is presented to be something for beginners to measure things without having to invest thousand dollars in expensive equipment. the 4th port is a reference(labeled REF)for what impedance you are tuning the antenna for. you would use a 50 or 75 ohm terminator. the one with 3 is just fixed at 50ohms. the newer one you can swap it out. you would match it with the impedance of your receiver. What you have is probably a 4-way non-terminated coupler, whereas the 3-way coupler in this tutorial is basically the same, but internally terminated with 50 Ohm load on 4th port. What you should do is to terminate the 4th port with 50 Ohm resistor according to the picture in upper reply. I sure would like to try this. Buy, I cannot seem to find clear information on installation and set up for RTL-SDR Panorama for Windows 7, 64 bit. I installed the software, it runs, but it does not see the dongle, reports can’t find configuration file error when I try to run it.. Can someone help me? 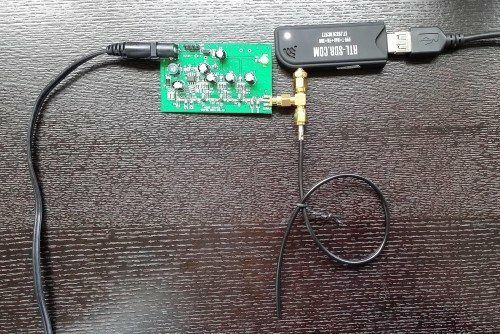 Using RTL-SDR (RTL2832U) . Thanks! do you have your rtl working in sdr# or another app. you have to install some special drivers first to use it as a SDR. get it working in sdr# then it should just work. In the section entitled, “Measuring the VSWR of an Antenna”, you disconnect the antenna to make your calibration measurement. Isn’t this going to cause reflections? Shouldn’t you terminate the IN port on the coupler instead of leaving it disconnected? Maybe there’s something I don’t understand about the coupler. I thought so too, there should be a 50ohm resistor on SMA connector applied. How can you use a directional coupler here that couples RF in forward direction if your input is from the antenna and the source is connected to the output? Is it not better to use a bidirectional coupler that couples both forward and reflected RF? Why not use RPITX? I’m trying to think of things that I can use it for without ‘transmitting’ as I’m a General Class licensee and know the law. When I used to work at ITT we had everything running from radio to radio through attenuators to test transmit and receive from the old radios to the new ones. I wanted to look into filter analyzers and an LCR meter using the RPITX as a signal source and RTL-SDR as the analyzer/freq. counter. 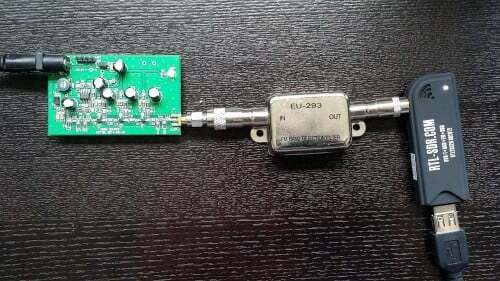 Being that this is used with a standard 24MHz – 1.7Ghz+/- dongle, is it at all possible to use this with a HF up converter for use of HF band testing? If so, would the noise source and software work due to the up conversion? Noise sources such as simple as this http://ham-radio.com/k6sti/nsrc.htm , http://www.mmccs.com/mmarc/n0ss/noise_source.pdf second stage (Q2) can probably be replaced with a MMIC, MAR-6 or equivalent or even the Ham It Up upconverter with the noise source components installed. Regarding the coupler, i’ve found a very good spec. one, but it is bi-directional…..it is still ok, or it Must be a directional coupler? yes a bydirectional couppler will work fine and in some applications are far superior. Remember to terminate the unused port with the desired resistor. Sharing Knowledge ! This is the concept of Open Source. To learn, add, explain and help others. Thanks for a very interesting and informative article. It came at exactly the right time as I have been thinking about how to test my home-brew Butterworth filters I’m using to separate the 70cm and 2m antennas feeding my preamp for satellite reception. Thanx, very nice tutorial. It’s possible to bring here (or dropbox etc.) spreadsheet template (xls, odt etc.) for all, here mentioned, calculations? Sure! Updated with spreadsheet links at the end of the post now. You might need to hard-refresh to update the page if you don’t see the links.